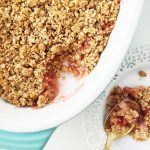 Have this Rhubarb Crisp Dessert on your table in under 1 hour. It’s tart, sweet and so delicious! Serve with vanilla ice cream. In an oven proof dish, mix together the rhubarb, sugar, water and flour. Set aside. In a separate bowl, combine the oats, flour, salt, sugar and butter. Then spread oat crumble mix on top of the rhubarb.